Organization is a funny thing. Once we start engaging in behavior that makes our lives more organized, our minds tend to become more happy because of it. Which I believe our lives are a pure representation of what is going on inside our mind. The world is simply a projection screen of which our mind is projecting on. This is why one person can see beauty in a piece of art. And another can come to an entirely different conclusion. So once we start organizing our lives, we can start to experience an internal calmness. This can give us even more motivation to become more and stay organized in all areas of our life. The more organized you are, the more your self esteem rises as well. You feel good because your are managing your surroundings. Not letting them manage you. Because of this, you gain an inner sense of empowerment. Which shows up in all areas of your life. I truly believe being organized is actually a form of self love. Because you are engaging in an act that is self loving. You love yourself enough to manage your life. And take action on cleaning and categorizing things in your existence. 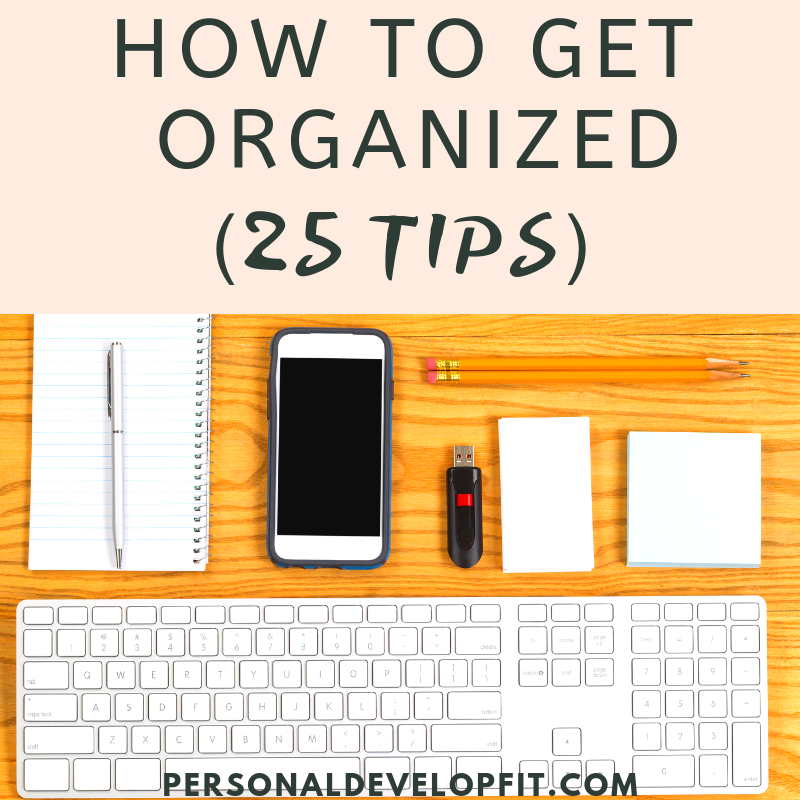 But how do you become more organized, so that you can reap the benefits I just talked about? What are the best ways to organize your life? Below are the best simple and practical tips you can incorporate in your life to take control of your surroundings. And because of it become a master or organization! There is something about having things in folders that puts my mind in a calm state. You can get a stack of a hundred for under 10 bucks. There is no reason not to use these babies. You can pick up a filing cabinet of Craigslist for 20 bucks and have all your files in one place. For me it becomes almost exciting to file things away. It gives me peace of mind to know that I have the files I need all in once place. That if I need something, I don’t have to remember where I put it. Or if I threw it away. That’s another point. Save all paperwork. You never know when you may need to reference it again. Plus it saves you time, money and energy so you don’t have to reprint it. Or request that it is sent to you. Nothing is worse than losing things because your place is too messy. This includes your car or office too. Becoming more organized can be as simple as picking things up and throwing things away as you go. Make it a nightly ritual to clean your place up a bit. Not deep cleaning or anything. Simple just do a scan of your environment. As for your car, don’t let trash pile up in there. When you get out each night, grab a handful of trash that has accumulated and toss it. Make sure the back seat is not filled with clothes or bags. Take it all in to your house. This will help you feel better on your way to and from work. It feels nice to be in a clutter free car! This will also help you feel less overwhelmed when it comes down to doing bigger cleaning. It will take less effort as you have been on top of it throughout the week or month. Hiring a cleaner may be a good investment if you don’t have one already. Our lives can become more organized by simply giving things away. There is nothing like a cluttered junk drawer. That can turn into a junk room or a storage locker full of it! When it comes down to it, we have to let go of things that don’t really serve a purpose in our lives anymore. Let yourself feel the guilt or awkward feelings of throwing out or donating things. Then move on from it. Put your peace of mind over clinging onto things. One of the most intimidating things to go through is an old box of copious amounts of photos. It is a good time to laugh and look at old memories. Don’t get me wrong. But we can declutter our lives by scanning our old photos and making digital albums out of them. Plus once you do so, you don’t have to worry about them getting damaged. It will save from bulking up your environment with space that frames and albums take up. You can also share them more easily with friends and family. Giving people a good laugh of a funny photo. Or an AWWW of you or your kids senior pic or first day of kindergarden! Or simply to roast a buddy with a picture in which you “promised” you would never show anybody! Or check this video out by Wall Street Journal! At the end of the day, if you really don’t want to toss the old gems, give them to someone who can appreciate them more. There is a mom or grandma out there that would see these worth their weight in gold. Giving someone joy and at the same time purging your space! This is a great habit to get into. Especially for us who like getting fresh clothes! If you buy a new shirt, donate an old one that you don’t wear as often. This way you aren’t attached to the past either. Your new garments represent where you are going with your life! In a positive and fresh direction. It will help you keep your wardrobe smaller, but more easy to use. Because you will have a bunch of go to outfits. Instead of trying to sift though old clothes that you don’t really want to wear as much. Especially for the ladies out there who are collect a myriad of differing shoes! Hang that baby from a door (or multiple doors) in your home. That way that don’t pile up in the closet. You can also use these shoe organizers to put your cleaning products in. Hang one from the inside of a door in your house that isn’t exposed to food. That way you can have a clutter free section under the sink. That way you can see all that is going on with your garments. All the options you have. And you can slide our your clothes more effectively then trying to find them through a stack piled straight up. This is fundamental to setting up a series of positive actions related to staying organized. It is the first win of the day. And it makes you feel more relaxed and tidy. One thing about writing things out at night that you need to get done, it helps you sleep better. It is journaling in a sense. To where you do a brain dump. It gives you a good template for your day in the morning. The next step you want to take is to schedule it into our day. We all know in a sense, how our day is going to play out. Most of us have schedules, rituals and routines that we partake in each day. Schedule your stuff around these things. If it isn’t on the schedule, it is most likely not going to get done! Also, have a mini spiral notebook on you at all times. Jot notes down on that sucker. That way you aren’t trying to remember all the good tips you thought about throughout the day. You can also write positive and encouraging things you hear and think about during your day. It can provide a positive space in which you embrace organization and getting things done. When it comes down to it, we will avoid sometimes at all costs, things that overwhelm us. We can’t get our head around a big task sometimes. So we abandon it or just keep putting it off. The way to feel less stressed about big projects is to break them down into bite sized chunks. For example if you need to clean the house, start with cleaning 10 feet of the place in diameter at a time. This will make the project look much more manageable. Do the first 10 feet. Then go work out or meditate. Then come back and do another 10 feet. Rinse and repeat until the project is done and you feel like a boss for knocking it out! You can also do this at work too. You can use this tactic to figure out what part of the task that your skills and knowledge can do best with. And then outsource or delegate other parts of the project to those more skilled or have more time. We all have lost our keys, phone or wallet. It always happens when we need to be somewhere right away. Thanks a lot Murphies Law! By hanging this thing in your home, you will know exactly where your items are. Get into the habit of putting them there right when you get home. Do so repeatedly and you will never lose these items again. These organizer hacks can even have positive sayings on them. Giving you a mental release of feel good hormones every time you look at it! You can also get good at this habit by being mindful of not placing things down randomly right when you walk in the house. Think about your actions as feel yourself putting things back in the proper place. The rule of thumb is that you can’t do two things at once effectively. The mind needs to focus on one thing at a time. I think this is BS! You can easily be cooking and unloading the dishwasher at the same time. Or stretching while you are listening to something work related. Sending out emails while you are waiting for a meeting. Or checking your account balance to track your expenses. Or listening to a meditation tape while you are working out. Chanel your ADD! This can help you get more done at the end of the day. And get your productivity levels on point. It gives you more time to do the things you love to do at the end of the day. Simple as the title. After each work day is done, clean that sucker out. Delete all the emails that you aren’t going to read. This is a great time unsubscribe from people you don’t read anymore. So that these emails don’t pile up. When it comes down to it, a tired mind is a lazy mind. It will make us want to take the easy way out. Leave things around the house. Not clean up as well when we are done cooking. Not put things in the right location when we are done with them. A well rested mind is ready to attack the day with optimal levels of energy and vitality. You will be more positive about staying organized. And thinking better will help you prioritize your day better and get more things done. Some of the most effective people I know almost plan their day by every single minute. They have a schedule and they stick to it. Now some things vary like meetings and family events. But the fact of the matter is that they develop discipline because this. Not having a schedule makes you feel overwhelmed. And you are likely to say yes to things that aren’t conducive to your goals. When we do things that are in line with our goals, we feel positive about ourselves. When we don’t we feel negative. Hence doing more things to sabotage our organization. Or at least not helping it. That is why it is important to set up a template of how each of your days will be. You most likely already know when you start work. Set up your workout at the same time. What time you cook breakfast. When you fill up the car with gas. When you do your grocery shopping. And stick to it. The more you stick to it, the more it becomes subconscious habit to do so. You become more disciplined naturally. We can become slaves to good habits or slaves to bad habits. Incorporate things into your schedule that you owe yourself. And do them at the exact time every single day. Of course you will go off here and there. But get back on the train as fast as possible when you do! At the end of the day, it all comes down to taking action. Don’t try to get everything perfect. Just try things as you go. Feel and figure out what works best for your style. And pick up new tricks along the way. Just start implementing one or more of these tips now. Don’t wait until the moment is right. Just action. Massive action is the cure all for almost everything in life. Soup kitchens would love donations of canned food that is piling up in the back of the pantry. Also, some of these cans may be expired. Throwing these out can create less clutter in your home. Write down your goals for the week, month and year. Then have a copy of your paper to-do list on this bad boy. This way you will see what you need to do that day, week or month. It will be more present in the brain. Letting our Reticular Activating System (RAS) go to work on finding answers for our challenges and things we need to get done. It will also keep you motivated to keep going after your goals. Keeping you on track and not distracted by people and things trying to pull you away from the big picture. We all have the magazine subscription that keeps coming each month. We either flip through it and leave it be. Or just never get to reading it at all and it ends up piling up on our coffee table. Save some money and unsubscribe to it. Better yet, swap it out for something that is going to help you get one of your big goals. Maybe Mens’s or Women’s Health. Wall Street Journal. Entrepreneur Magazine. SUCCESS Magazine. Anything that will help you grow and expand as a human being. And make you more successful and happy. Salt nearly empty? Toilet paper running low? Coffee grinds nearly out? Put it on the list and then take a picture of it on the way out of your house. That way you can shoot by the store on the way home and restock these things. This is probably my favorite tip of them all. Because I always forget certain passwords! Apps like KeePass, Sticky Password and LastPass are all awesome apps for this purpose. I get it, we all have a favorite show, or a few, that we just have to tune into each week and get caught up! By why not use the commercial time to get after it and clean up! You can knock out a good 5-15 minutes of cleaning out depending on how long your show is! Often times we are cleaning, we hit a nice stride, then come across something that has sentimental value. Or something that we may need to throw away or donate. Don’t think about it for even a second! Just keep cleaning. Leave the item for later. Come back to it and sentiment over it. Or contemplate whether you need to throw it out after you have been productive with your cleaning session! There you are my friends. 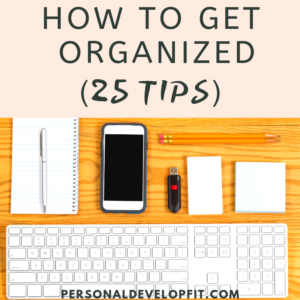 The best tips I know on how to get organized so that you can stay organized! I truly hope this helped on your pursuit to finding more organization in your life. Share with me what your favorite tips were. As well as tips that you know of that have helped you in the past and currently! Hope this is reaching you well, my friends!